Greetings from Beluthahatchee, in Northeastern Florida, where Stetson Kennedy lived and worked and where his friend Woody Guthrie once rambled. I have been invited to live in the guest house as part of the Songwriter In Residency Program started up by the Stetson Kennedy Foundation, and it has been very nice to be able to take the time to sit and create for a few days, or just sit and think-something that I simply don’t get to do as often as I would like. The world has become busier and busier, and the Foundation knows this, so there is no internet service here. As a temporary resident, I have been able to unplug and instigate a re-connection with nature by floating a kayak around the lake, observing the local flora and fauna, and ever so slightly jumpstart my relationship with the ever evasive yet ever patient spirituality of the earth. My life and my country are in a seriously transitional phase now, and slowing down to meditate on it all without the presence of constant media bombardment is helping to ease the stress. The Foundation property borders on a beautiful lake full of Cypress Trees laced with Spanish Moss and a few Osprey nests balanced up high. Many winged critters are flying about-only a few that I can name. The local squirrels are going crazy as I write these words, and various lizards and crawly critters skitter to and fro while no less that six box turtles sun bathe on the exposed log by the side of the dock. I keep trying to grab a photo of them in order that I might show my daughter but they always scoot off the log before I can get close enough. 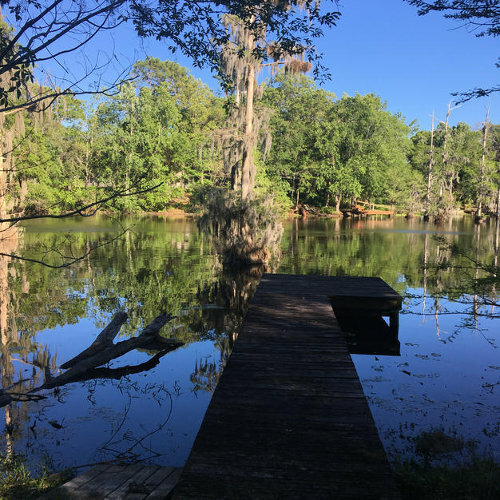 It’s a beautiful and mystical place, where “all unpleasantries are forgiven and forgotten,” and even with all the development that has occurred in the neighborhood, one still gets the feeling of being secluded in some wild Florida backwoods. Ah, but there I go again, reaching for the pocket oracle so that I can show someone else what I am up to, instead of just experiencing and processing it. As I said, there is no internet here, but of course all I have to do is turn on my phone in order to connect with the manic planet of braggarts of which I am very much involved in. I am as addicted to the internet as anyone could be, and I realized it’s not always about bragging. There are some very helpful, insightful, and inspirational friends out there posting great stuff in between all the fluff. In this case I feel like it was justified because I wanted to show my daughter the turtles, knowing full well that what I should really be doing is spending more time with my daughter and taking her to the places where she can have these experiences too. We do have camping plans set for the end of this month. Such is the dilemma of the traveling songwriter who also has children. I’m not the first to go through this, and I’m certainly not complaining, but I know in my heart that it is not right to be gone so much, and I’ve made to many mistakes listening to my head and not my heart, which all of us nature freaks know is the truest of the two minds. The fact also remains that this is this is my job and the traveling life is what I love. However, the very communion with nature that I am experiencing now, as well as last week when my daughter and I went camping in Tennessee, plus a long walk through Liverpool a few weeks ago while on tour in the United Kingdom, has me thinking that I need to take some time off the road and concentrate more on working from home. Who knows, I may even go back to school. I have commitments throughout the year, all the way to October, but after that I plan on changing up the game, working on a residency gig in Nashville, and writing and working from my new home in Whites Creek. Of course, plans change and invitations to do special events will arrive, but I will not plan two weeks of touring to get to and from these events as I have done in the past. All my life I have had to plan things well in advance just to make ends meet, and now I want to let it go and just say that 2018 will be a year of sticking closer to home and spending quality time with my daughter. Last night, while a full moon raged above-a “Pink Moon,” none the less, I sat on the dock, listened to the tree frog chorus, and worked on a song called “Safe Harbor,” using the DADGAD tuning that Nick Drake himself employed. Cat Stephens was most likely a fan too, as are a multitude of British folkies, and the riff for Moonshadow was never far away as the crisp shadow of me and my guitar were beaming off the dock as I partly worked, and partly drifted away into a place that none of us will ever be able to adequately explain. Creativity is funny that way in that it is possible to inspire but impossible to teach. Anyway it was the first time I had ever experimented with that particular tuning and therefore since I had no preoccupations or experience the song came quickly. Nothing too fancy. Just a basic melody using plenty of drone strings. The lyrics had a bit of topicality to them, and yet they were also of another time, for they began with the notion that Jesus Christ was himself born a refugee. It’s difficult not to write from a socially conscious platform with a huge portrait of Stetson Kennedy himself staring at you as you pass through the front room of the residency. Plus, let’s face it, the artists they chose for this residency have nurtured a tendency towards a strong notion of justice and human rights, which, in our liberal and somewhat logical minds, also means we care about the stewardship of our Environment. We strive to protect the environment from greedy human beings but what we wonder is if we will ever be able to protect human beings from greedy human beings. The planet will most likely survive us, but can we survive us? Is it understandable that we care about Human Rights and the Environment in somewhat equal measures? In the Liberal mind, which is usually less rigid about most situations, the answer is a definitive yes. We have been accused, rightly so, of being all over the map when it comes to causes and belief systems. There are any number of causes across the spectrum that we disperse our energies throughout. Sometimes we care much more about one than the other, causing the many little hammers on one door to just make a series of dents rather than one huge battering ram to knock the door down. The conservative sledgehammer is less likely to shape shift over time, although when pressed with overwhelming evidence, all of us have been forced to face up to the fact that we have seriously abused both Humanity and Mother Nature and that now some definitive moves have to be made in order to compensate. You think the healthcare system is going to go bankrupt under the weight of diabetes and obesity related diseases, cancer, etc…just wait until you see the cost of bailing out entire flooded cities. To many minds, the words Human Nature or Mother Nature go easily together. We humans are of the earth. We are earthlings. We were born of this earth and to the earth we will return. We are part of nature, no matter how hard we try to remove ourselves. The harder we fight nature, the harder we fight ourselves. When we fight ourselves, we are going against our nature, which is to survive. My cynical colleagues can accuse me of whatever they want. I am choosing to step away from my old thought patterns, because they were preventing me from growing as a person. Cynicism can be fun and even creative for some. I know that I employed it many times, but now, after facing a broken marriage and a splintered family which led to a rekindling of sobriety and the ongoing liberation of a severely arrested development, plus the financial insecurity of not knowing quite what I’m going to do if I stop touring since it is the primary stream of income for the modern songwriter outside of TV and Film placements-in the face of all this my personal brand of cynicism has somewhat faded. Others may build a perfectly respectable career out of necessary cynicism, but digging into it for inspiration or the notion of writing for the machine is not my bag. I am part confessional songwriter, part eavesdropping storyteller, but I am also, when it comes to Humankind, an optimist. I see the trouble we are in, but feel we can work our way out of it, mostly out of our collective and basic need for survival. The news has been extra brutal lately, so shutting off the phone and computer has helped steady the creative nerves. Tyrants, war, starvation, abuse, brutality, prejudice, persistent racism, and the confirmation of a Supreme Court judge by a President who was most definitely put into power with the help of the Russians. The notion that the President had anything to do with this is not the point, the fact that the Russians undermined and greatly affected our election is a proven fact, and one that has left many of us quite disturbed. This conservative victory is a lasting one, and I would hope that we on the side of compassion and Mother Nature must understand how important it is to unify and prevent further judicial appointments such as this, or resign ourselves to an extended period of de-evolution. It is difficult, however, since we are so spread out in our causes and notions. Even this essay covers way to many topics, but I am more into letting the words fly out than controlling them today. Sometimes it’s necessary to let the words flow. I vow to work on focus as this year goes on. Here are the lyrics I wrote for “Safe Harbor.” Perhaps they will change before I set down to record them, but the idea is here. I believe, like many anthropologists, that migration is part of human evolution. We have been migrating for centuries and will continue to do so as long as we exist. We will always try to go to where it’s easiest to feed our families. There’s nothing that can be done to stop this natural yearning to take care of our children and give them a better life. I wouldn’t call myself a Christian person. I believe there are good Christian people, as I believe there are good people of all religious faiths. It appears the bad ones have the loudest megaphones. I only write these words because I am tired of the ways of the two-faced Christian people who claim to follow the word of Jesus then do exactly the opposite, acting as if there is a difference between any of us when it comes to feeding our families and making a better life for our children. These folks are, in fact, not Christian whatsoever, and their hateful ways will eventually be swept away by the continuously rising tide of equality. Much like the mask of today's government employed Klansman who fronts that he is a Christian man but when we pull away the mask we see that he does not think all human beings are in fact human. Without a doubt, Jesus would not shut down any borders when it comes to taking care of refugees. There is more than enough room in this lifeboat for all of us. Jesus Christ was just a refugee. A helpless babe born in a barn. They raised him up on a cross of wood. because He wanted to provide safe harbor. Who are you to judge who will live free? Who are you to deny safe harbor? in regards to hate and destruction. when faced with providing safe harbor. we’ll not celebrate your life. and carry on providing safe harbor. Of course, I’ll have to step away from paradise in order to post these words, but such is the deal with ego verses nature. If we’re not damming up rivers we’re writing about damming up or removing the dams in our thought processes. Stetson Kennedy wanted me to be here and to return here- not just to write songs, but to commune with nature, and then communicate with you about my experiences, for he knew that many of the dilemmas faced by Humankind could be soothed by spending time in the natural world, and that we have a duty to take care of it in order that future generations may do the same.